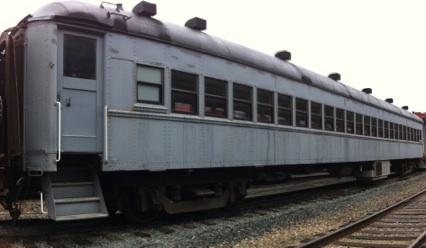 Built new as Southern Pacific Railroad (SP) coach #2101 for commute service on the Peninsula between San Jose and San Francisco; Retired in 1985 and sold to the California State Railroad Museum; acquired from the CSRM in 2004 after years of damage/vandalism while stored at the ex-SP Sacramento Shop yard. The interior was completely rebuilt by the PLA while the exterior was repaired by replacing all the windows, fixing rusted sashes and roof repairs during 2004-2007. In 2011 a new diesel generator was installed under the car.